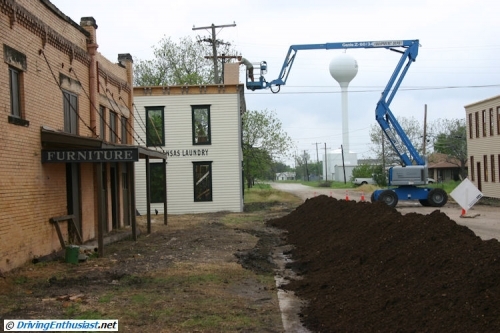 As originally reported last summer, the small town of Granger, Texas was remade earlier in 2010 to stand in for Fort Smith, Arkansas for the filming of the new True Grit remake. If you happen to attend the opening of the film today or see it in the weeks to come, look closely and compare what you see in the film to the set photos below. Granger, aka “Fort Smith, Arkansas” figures prominently in the beginning of the film, and again at the end. The scenes in the wilderness areas were filmed later in New Mexico. 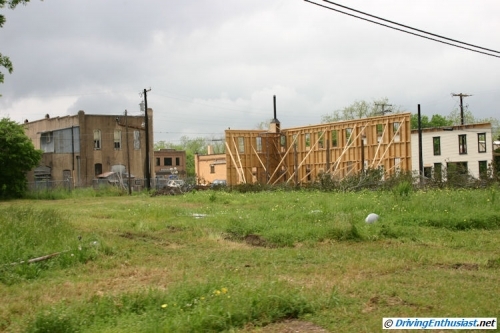 Locations in Blanco, Texas and Austin, Texas are used as well. 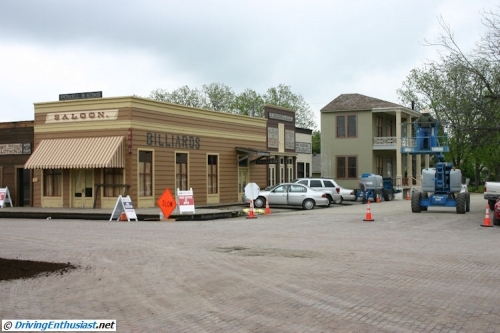 Two Austin locations are used for scenes set in Memphis, TN, taking place well after Mattie grows up. One wing of the state capitol will represent a Memphis train station. 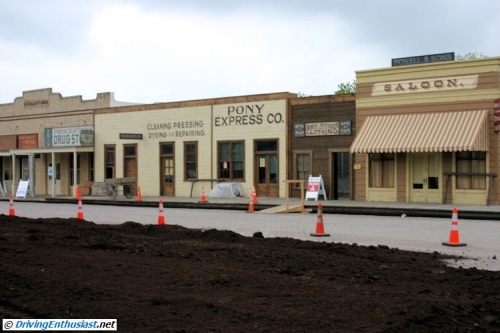 We read about the creation of the set last April, and immediately set out to see the town before it was closed to the public for shooting a few days later. And on the way to the town, we took the long way, visiting Louie Mueller BBQ for some excellent BBQ ribs. Granger barely exists these days, it’s peak was in the 1800s when it was an important railroad stop. Since then the population has radically shrunk, the town is just a shell of it’s earlier self, and it hasn’t changed much in 100 years. Therefore it was ideal to be used in the remake as a stand-in for Fort Smith. And a railroad line next to town also figures prominently in the movie… there is a scene with with a casket being loaded onto a train (sorry, no more spoilers!). The film opens in North America today, 22nd December, although we won’t be seeing it until Thursday night. The reviews so far are good, although they do make reference to some unnecessary humor in the movie. And you’ve seen the trailer (below) with reference to Rooster Cogburns missing eye. We don’t find that funny. If you’ve read the classic book by Charles Portis, you know that it is a very grim story, not only the killings and the path to justice, but also the story of the early years of young Mattie Ross. With the death of her Father, she had to grow up very quickly – not only bringing his killer to justice, but later taking over the family business. 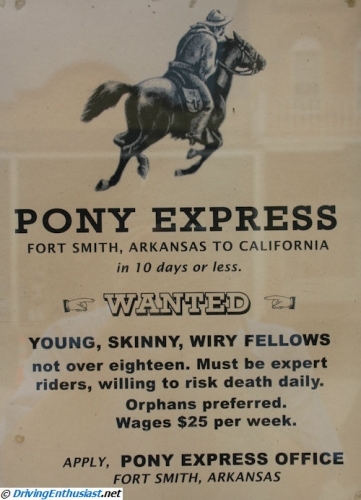 Very grim business; a classic western-type adventure and a coming-of-age story. We don’t see why the Coen Brothers thought they had to put silly humor around those events. 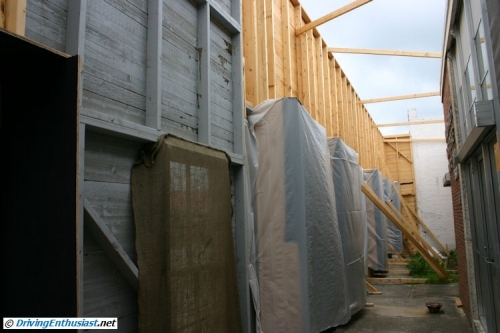 At the time of our visit, the reconstruction of the town was all but complete. The dirt street remained to be finished, but that would be done at the last moment. Many of the existing facades in the town were used as-is, some with new paint. Other facades were built for the film. 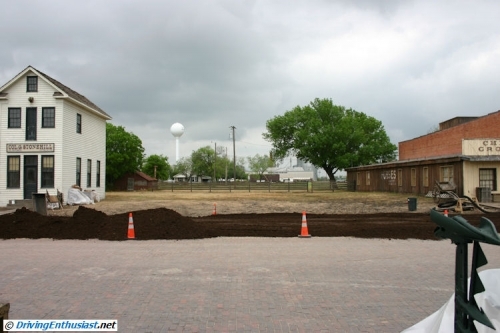 As we came thru town, a layer of dirt was being put over the existing brick and asphalt surface. Right now, it’s a very dark dirt, and we have to wonder if this will work or if another layer of lighter color dirt will be added on top. 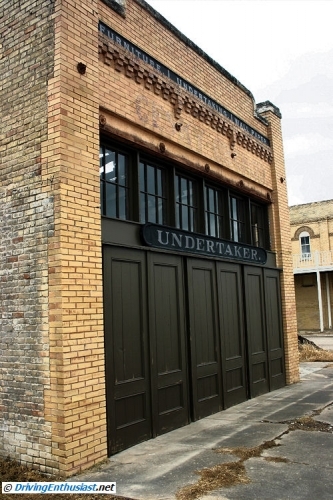 Below, you can see a mix of the original and new facades. This is a new building, purely a facade (nothing but supporting beams behind the outside). The lack of depth will be covered up by camera angles. 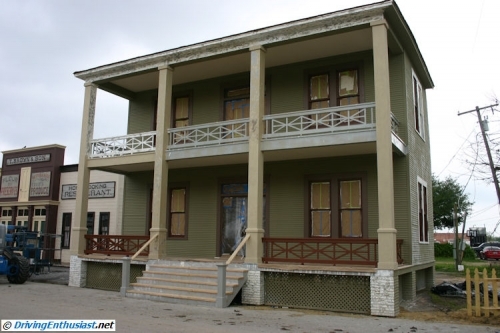 It is almost certainly the boarding house that Mattie will stay in, but it is also where her Father was shot down. If you remember the original film and book, her first night here was her worst. There is also a scene where Mattie visits the undertaker to pay him off. Interestingly, this building had a burnt-out and collapsed roof that is still in place – notice the light streaming in from above in the picture below. The windows will be darkened so that the burnt timbers do not show. 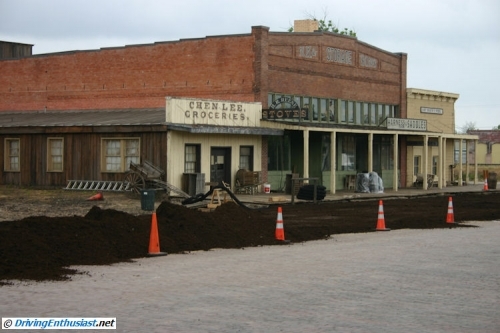 There are several side-streets, and most of them have been dressed for the film. 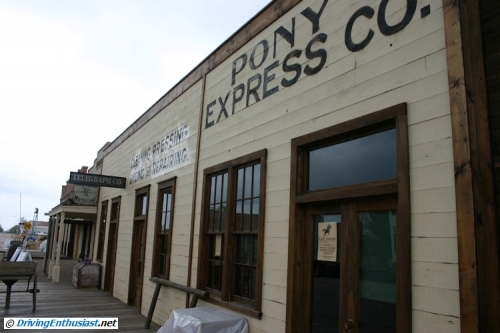 There is also a pony express office in town. Note the sidewalk, boards have been added to cover up the modern cement. Note this interesting solicitation in the window. A lot of props like this were already present in town. There is a more intricate facade over the existing post office. Stepping behind it, we see this. The gauze over the windows will give the appearance of interior light. This is an area where we would of thought another facade would have been built. Instead, given the water tower, perhaps CGI will be used here, at least to cover up the tower. A scene a block over, showing another facade from behind. Some telephone poles might also need CGI work. When you see the film, watch for the absense of the water town and power poles and note whethe they were removed with CGI, or just missed with a camera angle. Here’s the Chinese grocery where Rooster Cogburn has his room. When we visited the town, we wish we could have met some of the stars but of course we had no such luck! We were very fortunate to be able to walk freely around the set as it was being prepared. Now we’re looking forward to seeing the movie… although with some reservations because the original John Wayne film was so good.